Two portraits and a moment of joy. 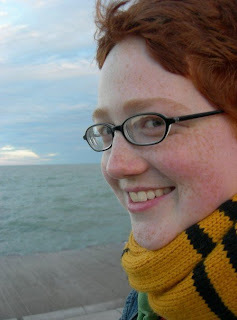 Some friends on Ravelry decided to start a thread for people to post their favorite photos of themselves. A way for us to see everyone's beautiful faces. I've realized that some of my favorite photos of myself are only available through Facebook, so I thought I'd share them with you. I mean, I kind of need a website to host the photos so I can link to them in the thread, but I really did want to share them with you. This is the oldest one, taken in Chicago a couple of years ago. 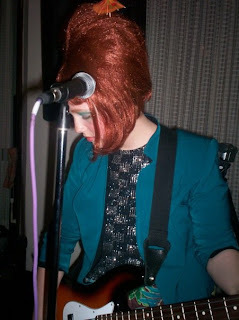 And this, of course, is from an OB-52's show. As if the bouffant and teal shoulder-pad jacket weren't a dead giveaway. 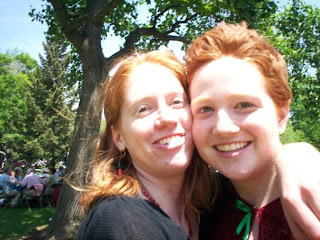 And this is me with Anna, just after graduation. Pretty soon, I'm going to get a bunch of photos from the Oberlin era in the mail and put them into photo albums. Remind me about it, and I'll share those with you in person some time. An excerpt from this article, by journalist Scott Anderson, which appears in this month's GQ. But not on their website, and not in any of the copies of GQ that end up in Russia. "One of the odder footnotes to the whole affair was a statement that Gennady Seleznyov, the Speaker of the Duma, had made on the floor of Parliament on the morning of September 13, 01999. I have just received a report, he had announced to legislators. An apartment building in the city of Volgodonsk was blown up last night. Mr. Speaker, please explain, he had asked Seleznyov on the Parliament floor, how come you told us on Monday about the blast that occurred on Thursday?" I could have told you about two years ago that Chicago was pretty great. But now, I have more evidence. As many of you know, I'm spending the next year with the Lutheran Volunteer Corps, living in community with other volunteers, and volunteering at a church (most placements aren't in local churches, but mine is). Specifically, I am working at Immanuel Lutheran Church, in Edgewater, as their Youth Outreach Coordinator. I'm working with some after school programs, as well as Sunday School. 1. Saw a Cubs game (Thanks for the tickets, Bret's mom!). They actually won. 2. At the Cubs game, found a Blackberry. Housemates and I got it back to the orthopedic surgeon it belonged to, and he bought us a round of drinks. 3. Helped a housemate make a chocolate souffle. 4. In conjuction with other housemates, got the souffle-making housemate hooked on Firefly. 5. Made a tasty eggplant parmesean. 6. Briefly ignored the vegetarianism and had some deep-dish pizza at Giordano's with my dad and brother. 7. Crocheted (!) a bird. Photos later. 8. Took my brother (and dad) to see the bean. 9. Saw a concert in Grant Park. One of the bands tried to be the Decembrists, but failed. 10. Got tix for the Hanson concert in October. 11. Visited my yarn store; bought sale sock yarn. Again, photos later. But they gave me a tote bag, and it has reaffirmed my love for them. 12. Wrote a song. I was thinking about creation (since the first Sunday School curriculum I'm doing with the kids is called 'God Makes a World'). Flipped through my Bible and ran across Psalm 19. Still enjoying the hell out of public transport. Made up on the spot, regaled to a friend via Gmail chat, and now shared with you. Capitalized and punctuated for your reading pleasure. So once, there was a bedbug. Now this bedbug was really friendly and outgoing, or wanted to be, but he was really lonely. He didn't have any bedbug friends! Mr. Bedbug lived inside the walls of the bedroom of a little girl named Louisa. Mr. Bedbug didn't like living in the walls. The spiders and other small bugs didn't talk to him, and the old crochety cockroach that lived down the hall scared him a lot. One day, Mr. Bedbug crawled out of Louisa's wall, and decided to eat himself a little home in Louisa's dresser. But Louisa's dresser wasn't ideal. He got a little bit of light, but only when Louisa opened the drawer to pull out some clothes. Sometimes, Louisa's mother opened the drawer, to put clothes back in, but somehow, that was never as much fun. "The clothes! ", thought Mr. Bedbug. "What if I lived in the clothes? There's that green sweater that Louisa really likes. If I lived in that, then I would be around Louisa all of the time! I could see the world, and make friends!" So Mr. Bedbug packed up his nonexistent belongings, and waited patiently. In a few days, Louisa's mother put the green sweater in the dresser drawer. Mr. Bedbug hopped onto it and nestled in. Living in a sweater was wonderful! Louisa saw and did so many wonderful things every day! But one thing still made Mr. Bedbug sad. Louisa would talk, but every time Mr. Bedbug responded, Louisa ignored him! He really wanted a friend, and Mr. Bedbug thought he was being very nice. But it was like she barely even noticed him. So one day, he got angry. And you know what happens when bedbugs get angry. But Louisa still didn't notice. She said something about maybe being allergic to something and asked her mother about going to a dermatologist. So Louisa's mother set up an appointment. Mr. Bedbug was very sad, and still very lonely. So the night before the appointment, when Louisa was getting ready for to go to sleep, she took off her green sweater and threw it onto the bed. Mr. Bedbug was feeling quite cynical (and maybe the sweater was starting to smell, or maybe it was going to get washed tomorrow), so Mr. Bedbug decided to leave. "Anywhere is better that here! ", he thought. So he jumped onto the bed. Nestling down into the bed, Mr. Bedbug heard a noise. Noises, that kind of sounded like him! Mr. Bedbug went to investigate. a GIANT party. Hundreds of other bedbugs! Chatting and eating hors douvres and knocking over the punch bowl. He casually strolled over and introduced himself. By the end of the night he had many, many new friends, who listened to him when he talked, and even talked back to him! So Mr. Bedbug, Roger, Gertrude, Eugene and Rhonda went on many adventures together and had a grand time. And Louisa had a terrible bedbug infestation. Once they finally figured out what was going on, the only answer was to burn the mattress, and the dresser and the sweater. The moral of the story is: Catch bedbug infestations while they're small.